Did you know that a slower metabolism and weight gain are NOT inevitable as you get older? Did you know that you’re NOT destined to lose muscle, strength, stamina, flexibility, and balance with age either? However, the ol’ “use it or lose it” adage is indeed true, and in this information-packed episode of the BioTrust Radio health and fitness podcast, Shawn and Tim will dole out 5 bulletproof strategies to help you combat age-related metabolic decline, experience quality weight loss, and best of all, enjoy healthy aging! In this fast-paced episode of the BioTrust Radio health and fitness podcast, Shawn and Tim cover a ton of ground as they share countless healthy aging tips and practical takeaways, including several strategies to combat some of the most common age-related complaints: Metabolic Decline and Weight Gain. While these are indeed associated with age, as you’ll find out right away, Shawn and Tim burst the pessimistic bubble that they are NOT destiny. 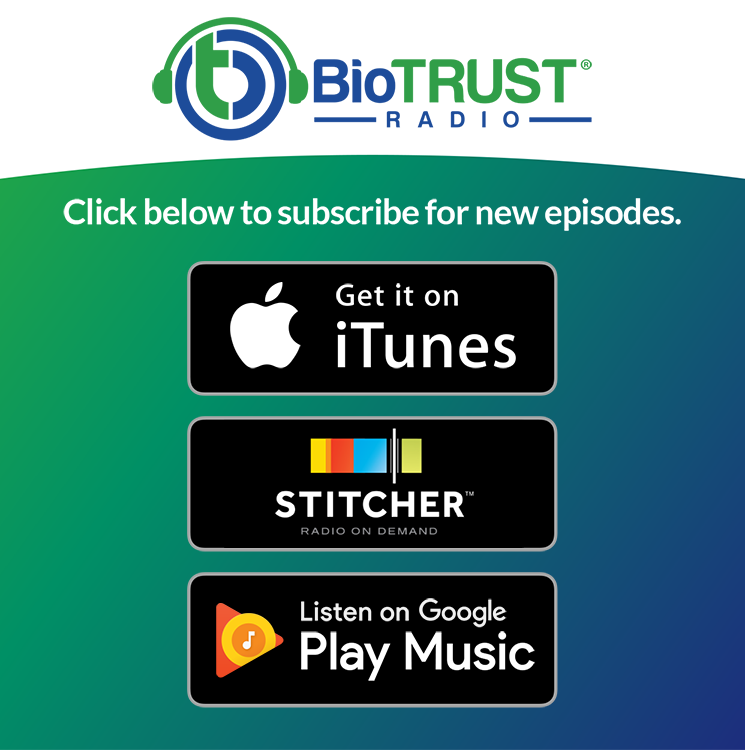 In other words, you’re not doomed, especially when you put into practice the healthy aging tips shared in this episode of BioTrust Radio. Many people also believe that losing muscle, strength, flexibility, mobility, balance, and endurance are also a by-product of getting older. But are they? Once again, you may be surprised, but the truth is that there are healthy aging tips that can protect these important attributes as well. ● BioTrust Radio Episode 8: What’s your ideal weight? ● Ask the Coaches: What are the top foods to boost metabolism? ● Healthy Aging Tips: What’s the best cardio for weight loss? ● Healthy Aging Tips: Why is protein important for QUALITY WEIGHT LOSS? ● Ask the Coaches: Is menopause causing my weight gain? ● Healthy Aging Tips: What is skinny fat and what is ‘normal weight’? Shawn: Hey, this is Shawn and Tim, and welcome back to BioTrust Radio. Tim: Hey there everybody. We’re here today to talk healthy aging tips. Shawn: Oh, this is a great topic. I’m pretty excited about this one. Tim: Me too, Shawn. This is something that covers of lot of ground, so we’re going to do our best to cover it all in today’s episode. There’s a good chance that we might overflow into another one. But one of the most common concerns that I hear from coaching clients and customers is weight gain with aging. Like we talked about, there’s a lot of variables under the umbrella of healthy aging, but certainly weight management is one of them. So maybe that’s a good jump-off point. Shawn: When we’re talking about healthy aging tips that means all ages. Really, you start aging the day you’re born. But, I suppose that people really start to notice the telltale signs of aging in their 30s and their 40s. And I know you have some experience with that as a trainer and as a nutritionist, as well. So what do you think about these metabolic changes, these hormonal changes over time as we age. I mean, what have you seen, what’s real, what’s not real, what’s overstated, and should people just throw up their hands and say, “I have no control here,” or do they really have more power than they give themselves credit for? Tim: Yeah, that’s an awesome segue because I think we often are led to believe, and sometimes becomes a self-fulfilling prophecy, that age-related becomes an adjective for health conditions, for weight gain, for all these things. So, absolutely we see age‑related decline in metabolic rate. Tim: And that’s something that I think was a good starting point to talk about. So, starting at the age of 20, every decade we see, on average, a 2-4% decrease in metabolic rate. Which doesn’t sound lik much, but that adds up over time. So there is this age-related decline in metabolic rate. That doesn’t mean that age causes it. It just means that it’s associated with it. Shawn: There’s a correlation there with the existing data. But yes, there’s also the whole phenomenon of 75 is the new 60, and 60 is the new 40, and whatever. People that are working out, we’re seeing like a 55-year-old male in CrossFit and he’s got six-pack abs and he’s defying all this stuff. I think, and certainly with the way people are eating like paleo, primal, whole food, like going back to away from processed foods. We’re seeing supplement interventions like using protein powders and multivitamins, and fish oil. I think all these things add up that some people are aging much more healthy than others. Tim: Muscle is metabolically active. Maybe sometimes that’s a bit overstated, but how much calorie it burns, but it is still very metabolically costly tissue. Tim: And what we also see is a decrease in physical activity. These are lifestyle-related things. Basically, my point is that the decrease in metabolic rate can basically be offset by being more active. That’s one of the healthy aging tips: Be more active. And another one of the healthy aging tips is to do more activities that can help preserve and/or build muscle mass. Shawn: Right. Which actually spares bone mineral density as well. We talked about that on another episode. There’s been studies with 90-plus-year-olds that started working out with weights and they were able to not only build muscle back but build back—without any supplements, without any drugs—bone mineral density by just lifting weights. Tim: Right, that’s amazing. So that’s another component, definitely another of the healthy aging tips, is maintaining your bone mass and your bone mineral density. So, there’s several healthy aging tips, and take-home point number one is that metabolic decline is not inevitable. We can offset these things with physical activity, especially doing things like strength training to maintain and protect our muscle mass. We’ve talked about resistance training in other episodes on the fitness myths. We spent a lot of time talking about strength training. Strength training is for everyone, not just bodybuilders and athletes. We also talked about how you don’t have to necessarily lift heavy weights to build muscle; although, lifting moderately heavy weights is important for maintaining strength. But I’m just going to take a look here. There’s some research from Brendan Egan, over in Ireland, and some of his colleagues. They basically they had a group of people do bodyweight exercises three times a week for 30 minutes. It was a 30-minute bodyweight workout and they did this for 6 to 12 weeks. And that increased muscle mass by 3% in this population. So, think about that. In 6 to 12 weeks, this group of people increased the amount of muscle mass they had, by the same amount of muscle that they could potentially lose in a decade. Tim: So, 6 to 12 weeks of intense or focused effort can offset a decade of muscle mass loss. Shawn: And it sounds like, “Oh, that’s easy.” Bodyweight only, it sounds like just walking around. But if you think about how hard push-ups can be or lunges, or some of these leg lifts, or whatever, that you could just do around the house. And then it’s easy to add in a little weight. People think you need to spend all this money, get all this equipment; the bands or the dumbbells, or whatever to have around the house. You have weight everywhere around the house. You can use cans of vegetables. You can use a gallon of milk. You can use things like that to just rep out with. Tim: Exactly, and I think that’s a great point because we talked about how the amount of weight isn’t necessarily as important as the degree of effort. Tim: That’s another one of the healthy aging tips. If you are doing body weight exercises, you still have to push yourself to a point of exertion. You don’t have to pass out from working out so hard. But light or heavy, you still have to push yourself to really make progress. Shawn: Yeah. I’ve always thought like the first whatever reps are a lot less important than the last rep you do. It’s like whatever that last rep is, is the one that’s really making the impact. It’s really good to kind of train towards failure and certainly effort is what you’re saying. Tim: Yeah, definitely degree of effort. On the topic of muscle mass and strength training, another there’s no question that another one of the healthy aging tips falls under the umbrella of nutrition, particularly protein intake. Tim: So that’s a that’s a very important component of our healthy aging tips. Shawn: Huge one. As we age, muscle protein synthesis, which is the accretion, the building of muscle mass, like being in an anabolic state versus catabolic where you’re breaking muscle down, it’s harder to optimize muscle protein synthesis as we age. One of the reasons I think why that is—well, maybe two reasons—we have a decline in testosterone, male or female, which certainly we know with anabolic steroids, testosterone helps build muscle mass, for sure. Some of that could be the hormonal decline. But I think the bigger issue is the insulin sensitivity, and for muscle protein synthesis there’s a key amino acid called “leucine,” that’s a branched-chain amino acid, and that one turns on the muscle protein synthesis mechanism. It’s all about not necessarily how much you consume, it’s all about how quickly it hits the blood and peaks and hits this threshold. So, if you have poor insulin sensitivity, it takes longer and it’s harder to hit that peak as quick. So you actually need potentially less protein to turn on muscle protein synthesis when you’re young than when you’re old. And that’s why you’re seeing people that are in their 50s, 60s, 70s, 80s, that they need like 3, 4, 5 grams of leucine, which means 25, 30, 40, whatever grams of protein, and they’re just not getting that in one sitting, and it really needs to be. It’s less valuable to get your protein allotment kind of spread out through the day. You really need that protein bolus to hit that muscle protein synthesis threshold. What do you think? Tim: Yeah, definitely, and all these pieces tie together. Practically speaking, I don’t know that we know exactly what this this amount of this key amino acid, leucine, is it that we need. We just know that it seems like it’s higher as we get older. We don’t necessarily know how much protein we need. So if we wanted to tease out some practical healthy aging tips, I think we could draw from the recent research, which indicates that probably somewhere around 0.7 grams per pound of body weight is maybe a good starting point for most people. But to your point, it does seem to be pretty clear that as we get older that a larger amount of protein is necessary. Which is interesting and leads us into another one of the healthy aging tips because another thing that we see as people age is that they actually do eat less. Tim: And when we eat, we actually burn calories; the thermic effect of feeding. And so another component of that decrease in metabolic rate is actually because we’re eating less food. There’s some research like when you match activity levels and food intake, that there is no age-related metabolic decline. So, just another interesting fact, and we could actually consider that another one of our healthy aging tips. I’m not saying like go overeat, necessarily or anything. But if you are going to overeat, probably a good idea to overeat protein. Shawn: Overeat protein. Yeah, exactly. It’s nice that there’s more foods now that are saying 10 grams of protein and this and that. But again, it’s better to have a larger amount of protein in one sitting, to really optimize muscle protein synthesis than it is to have small amounts of protein throughout the day. And that’s been shown in some studies that that’s going to optimize muscle protein synthesis more. So, hopefully you can do that and spare your lean body mass. Tim: Yeah, so practically speaking, we’re talking about having at least 30 grams of protein, 30 to 40 grams of protein a few times a day maybe, you think? Is that a good takeaway for people looking for healthy aging tips? Shawn: Yes. Yeah, exactly. I think that would be a good amount. Maybe if you’re not vegan, then certainly eggs and meat and cheese and things like that. And then if you are vegan, then I would say like nuts would be a very good source. Tim: Legumes, beans, and things like that. For me, when people ask me supplement-wise what should I use, it depends. It’s definitely needs/goals-related, but protein supplement is huge. It’s definitely what I would consider foundational for nearly everyone. And to your point, if I eat animal-based products, then a milk-based protein supplement is a great idea, like whey protein-based supplement. If I’m a vegan, vegetarian, or I prefer plant-based foods, then a plant-based protein supplement would be would be ideal. Shawn: Yeah, and to go back to my point, when you’re young and you’re soaring with your hormones and you are highly insulin sensitive, maybe you can just eat your way to lots of muscle mass. It’s very easy. But as you age, you often lose muscle mass and gain fat mass—you’re essentially trading off these tissues like you’re talking about. And that’s obviously an issue and it becomes harder and harder to eat your way to optimized muscle protein synthesis. So I would say it’s more important as you age to have that protein powder, like BioTrust Low Carb, or whatever. I would definitely look into a protein powder that tests out as reliable. They don’t do things like nitrogen spiking, which we talked about on a different show. But just get a reliable good-tasting protein that you would use day in and day out and that’s the most important thing. But that would help where the appetite isn’t so great, especially with some people as they age. Like you said, their appetite can go down. And maybe it’s hard to get 30 or 40 grams of protein in a sitting. So that’s a much easier way to add that in as an extra protein meal. Tim: Yeah, exactly. And I like that you brought up the idea that people are often “trading” muscle for fat as they get older. This might be a little a little segue because we talked about that 3 to 8% decrease in muscle mass. And around that same time, like 30s 40s, I don’t think most people are losing weight. Most people are gaining weight. Tim: So, if they’re just watching the scale, they are seeing the weight gain, but they’re also losing muscle mass at the same time, which is really scary. So not only am I getting fat, I’m losing muscle and bone. Shawn: And maybe dehydrated, so they don’t even have that healthy water weight that they’d have. Tim: So that makes that weight gain even scarier. Even if you’re just “normal” weight, which we’re going to talk about in a future episode, like what is a healthy weight and things like that. But this brings up another one of our healthy aging tips, as we age, of quality weight loss, and so not just focusing on the number on a scale. The scale is just telling you about net changes in body mass. It’s not really telling you about the quality of that tissue. Tim: So, this is where measurements, whether it’s body composition or even like a tape measure is probably a reasonable tool to use for some people. But if you can get body fat tested then that would be ideal because it’s going to give you a percentage of fat mass versus the percentage of fat free mass, which is going to be largely muscle, tissue, organs, and bone. So typically, you want to see the fat mass percentage going down and you want to see the fat free mass at least staying the same, if not, getting better. Shawn: Exactly. Those are great points. Well, what about flexibility, mobility, balance, strength, and those kinds of things. Is it inevitable that we won’t be able to touch our toes as we get older? Is it inevitable that you won’t be able to run, maybe sprint? Is it inevitable that you can’t have the same balance? Is it inevitable that you can’t lift the same weight you could 20 years ago? What do you think? Tim: In my experience, no, it’s not inevitable. It does take progressive training, just like any other type of physical attribute that you’re going for. Whether I want to get better aerobic conditioning or better strength, it does take dedicated effort. And if you look to something like the American College of Sports Medicine, ACSM, they would recommend that you have an overall all-encompassing fitness program that includes strength training; cardiovascular activity, which is going to be can be a combination of your traditional aerobic and/or like we talked about before, high-intensity interval training which is probably more efficient. At least as effective, if not, more effective and more efficient form of cardio. Flexibility and mobility, I like that you separated those two because they’re not the same. And then balance or stability type of traits. So those are all important components that you need to have in your program. Shawn: There’s people that are 70, 80, 90 ding Tai Chi or yoga, then they’re more flexible than I am right now right, and I’m pretty active. I mean, you can still do that at any age. Again, I don’t think anything’s inevitable, like you just throw in the towel. We’re certainly seeing more people at the gym that are aging in a very healthy manner and they’re still extremely strong no matter the age. I mean, I’ve seen guys power lifting at 70 or whatever. So, no matter your age, it’s always inspiring to me. I’m 43 now, but even when I was 30 in the gym and I see some guy who’s hitting it that’s 80 years old, I’m like “Man, okay. Like I see you ‘bro.” And that’s inspiring to me. I’m like, well, I need to start putting in more work. So, I love that. You don’t just have to throw in the towel. I think it’s just a matter of we become less active and we don’t get as much sleep, potentially. Americans are very sleep-deprived. We’re definitely not hydrated very well. We’re not getting enough protein. And we’re not maybe doing the right type of exercise, even if we are exercising. As you age, you’re like, “Okay, well I’ll just take a walk,” or “I’ll play some tennis.” And all that’s great for just movement versus especially just being sedentary and sitting around, but it’s not weight training, like we said, which really helps with maintaining lean body mass and bone mineral density, and your muscle mass. So those things kind of like start, I think, being traded off, and that’s where you see some of these issues. That also can contribute to the insulin insensitivity because we know that staying active and training can help with insulin sensitivity, more muscle mass helps with insulin sensitivity, so it’s kind of a downward spiral when you become inactive and you stop doing weight training and you stop getting enough protein. Tim: Yeah, absolutely. I want just give a quick metaphor that came to mind when you were talking about being inactive and how that puts us at a greater risk for things like falling or just reduces our flexibility, reduces our balance and things like that, that these are probably activity-related things as well. My daughter, my daughter’s about 16 months old. She didn’t come out of the womb and immediately start walking. She’s basically sedentary and then through her cycle she starts to figure out how to crawl and then she figures out how to stand. Now the first time she stands, she doesn’t have perfect posture, right? She’s wobbly. Her nervous system is figuring this all out. Then she starts taking some steps, and the first time she takes a step does she successfully string together ten or twelve steps? No, it’s like one or two and fall down. But she gets back up and she keeps moving and her body figures it out. And over time, my point is that it’s a progression, and then you have to expose your body and your nervous system to these things and you just keep working at it. But that cycle changes. As we become more and more sedentary, our nervous system is not shutting down, per se, but it’s kind of like “use it or lose it,” it forgets what’s there. So flexibility, there’s certainly a tissue component to that, but there’s a nervous system component to it as well. Tim: As simple as it seems, another one of our healthy aging tips is that if you don’t use it, you lose it. Same as balance; you don’t use it, you lose it. You and I could sit here for five hours, theoretically, and when we first stood up it would take a couple of seconds for us to establish equilibrium. That just adds up over time. So, my point there is that it takes practice. It takes continued training, but these things are very trainable and they’re not inevitable. Shawn: Right, right, exactly. Well, what about sitting, I mean, how bad is that to the body? What do you think about the discussion around sitting and how bad it is for our health? And are there any healthy aging tips that we can share? Tim: Yeah, that’s a good one. Some of the things you hear is that like sitting is the new smoking and things like that. There’s not like randomized controlled trials that compare like okay you sit for six hours, you smoke six packs of cigarettes, so we don’t really know if that’s the case. But definitely there’s some evidence there that suggests that that sitting is really, I guess, killing us, right? Tim: It’s literally damaging to our health in a lot of different ways. Dr. Jim Levine at the Mayo Clinic has done a lot of research on sitting. I know you and I both often work at standing desks because we do a lot of work at the computer and meetings, things like that, and so we do a lot of standing. So that’s another of our healthy aging tips: any opportunity that you can get to move around is important. I won’t debate. I do think that sitting is very damaging to our health, especially inactive sitting. There’s things you can do while you’re stilling. Gosh, there’s a study where people that fidgeted while they sat, actually, that was protective of their health. So whether it was like moving their legs, and I know that you guys probably get annoyed at me because I’m moving around in my chair, but that’s just kind of innate to me, but fidgeting is a protective mechanism when you’re sitting. Any small movements. As soon as you stand up, I think it’s something like your metabolic rate is increased two to three times. And then your cells start to work and start to use glucose more efficiently, just by standing. Now standing still for prolonged periods of time may be just as detrimental as sitting still, so it’s better to move any point you get. But any movement is good movement. Shawn: Well, you talked about “you don’t use it, you lose it,” and certainly I think there’s changes that would take place over time when your body’s used to being in these positions. I know as soon as you put your head forward, your cervical spine, your lumbar spine moves in the same direction, your pelvis tilts forward. When you tilt your pelvis back, like you should, then your head naturally goes back into the correct position. So your spine is starting to form a C as you sit, as you’re aging for years doing all the sitting. I know another thing is like people flop down into chairs. They don’t lower themselves. They don’t do that kind of a squat, like they should. We actually just fall into our chairs, so we’re losing like our glute activation. All those kinds of things are happening. Your glutes are an incredible source of power for you, that losing your ability to have strong glutes is contributing to a lot of back pain and a lot of strength loss. Then again, having your shoulders roll forward from typing on a computer and having your neck forward, I mean, all that’s going to have effects over time with your discs potentially degenerating because they’re not in a healthy spinal position. And then there’s less blood flow needed. Tim: Super sad. And to your point, going back to what you said, being detrimental to health. Tim: The fitness trackers can be really helpful to kind of just gauge where you’re at. But another thing like along those lines is if you’re sitting, what are you not doing? You’re not moving. So another component, kind tying into our healthy aging tips and with what we talked about at the beginning, is of metabolism is something called non-exercise activity thermogenesis. Tim: Exactly. So that’s just basically any kind of spontaneous activity throughout the day. And that’s an area that we typically see the biggest decline besides physical activity, in metabolic rate over time as we age. So people are just moving less, overall. Shawn: Yeah, and you brought fidgeting before, but the “fidget factor” as they call it, is actually one of the biggest metabolic advantages that they think people that naturally just keep weight off, for whatever reason. Maybe there’s some physiological reasons that they have the fidget factor, like they’re a certain personality type or they have hyperthyroid or whatever it is. But the reverse is true. That the people that fidget the most have the least amount of fat mass over time. So that’s interesting and definitely an addition to our healthy aging tips. Tim: Yeah, and that really ties into, I mentioned Dr. Levine at the Mayo Clinic. He’s done some really interesting studies on NEAT, on Non-Exercise Activity Thermogenesis. Basically, one of the studies that’s really interesting to me is that they overfed this group of people. That’s kind of a fun study, right? Tim: Eat as much as we tell you to eat and you should gain weight. It’s kind of funny. So, they had this group of people and they overfed him. And when you overfeed someone, you expect them to gain a certain amount of weight. What they found was that some people gained the amount of weight that they expected, some people gained drastically less. There was some kind of innate metabolic protective mechanism in place. And so what they had also done was put activity trackers on these people, and if I believe correctly, they had like underwear that monitored them because they wanted to monitor them all times a day, so they had activity trackers placed in the underwear somehow. Kind of funny. But the people that gained less weight than was expected were just way more active. In the face of overfeeding, they just fidgeted more, they got up more throughout the day. They did different things like that to protect themselves from weight gain. So, just as the body has protective mechanisms in place against weight loss, some bodies have protective mechanisms in place against weight gain. And you and I have seen that in various people. So to tie it all together, another thing is just to be more active throughout the day. And with the sitting thing, another thing to add would be that the American Heart Association had an interesting statement. I’m not going to botch a quote, so I’m just going to paraphrase, is just that an hour or so of exercise a day really can’t undo the effects of long-term sedentary-ism or long-term sitting. So being physically active, like we’ve talked about at the beginning, is very important, but we also have to be more active throughout the day. So, sit at work, things like that, if that’s part of your job, maybe see if you can get a stand up desk or one of the Varidesks that goes up and down. Also, maybe set a timer on your phone, or if you have an activity monitor, set an alarm on it so every hour you get up. Those are healthy aging tips that everyone can benefit from. Shawn: Get up, stretch, get some water. Shawn: Take your eyes off the monitor for a little bit, and all these kinds of healthy things. Everyone knows like if you take a walk, just for a little bit, how much cerebrally that helps you get back to focusing. And again, when you’re in the sitting position and you’re slouched, or whatever, that you’re not getting blood flow that’s optimal, and that includes the brain. Shawn: You know, you’re not nourishing the brain with the oxygen and the blood that it needs in the same way as if you’re active, you’re moving around. Exactly, I agree. Get up, stretch, do all the good stuff. Tim: So that will be a perfect segue into what we’re going to talk about in the next episode when we provide some healthy aging tips surrounding cognitive health. We’ll talk about how exercise ties into that, what we can do to protect and preserve cognitive function, memory, and all that kind of things as we get older, and we’re going to dive into some other things like digestion. Just a bunch of good stuff coming up in the next episode. So are there any final thoughts that you have for us today, Shawn? Shawn: Well don’t forget to listen, right? Hopefully, we’ll keep your brain sharp and your body sharp with healthy aging tips like these, and hopefully you’re enjoying this content. And we’ll keep cranking it out if you keep listening. You’re welcome to list any questions you have. We actually have some episodes coming up where we’re going to answer your questions that you’ve put up on the Facebook group. And I’m just really excited about this community that we’re building. So, that’s it. Tim: Absolutely. Thanks for listening, guys. We’ll look forward to seeing you on the BioTrust Facebook group, and let us know how we can help you. That’s why we’re here. Shawn: Thanks, guys. See you.